Up until last summer, I didn't really have neons on my radar or in my stash. I'm a child of the late 80s early 90s, so I was there when neon came searing onto our eyeballs back in the day, and if we're going to be really honest? 80s fashion was kind of awful. It was a big old hodge podge mess of neon, arobic gear, and poor choices. Spiral bangs, anyone? Flash forward to last summer and the Orly Hot Tropics collection. It officially changed my mind about neon. I wore neon pink polish almost all last summer. I love bright pinks and hot pinks, so neon pink probably wasn't too far of a stretch. I'd been tempted to buy Ali many times during Zoya's amazing sales, and finally, in February, I had a 50% off coupon burning in my pocket. Ali was mine! Flash back to the summer of 2010... it was June and Pretty Little Liars had just premiered. The show seriously had me hooked from the first episode. I mentioned here about how the show introduced me to accent manis. 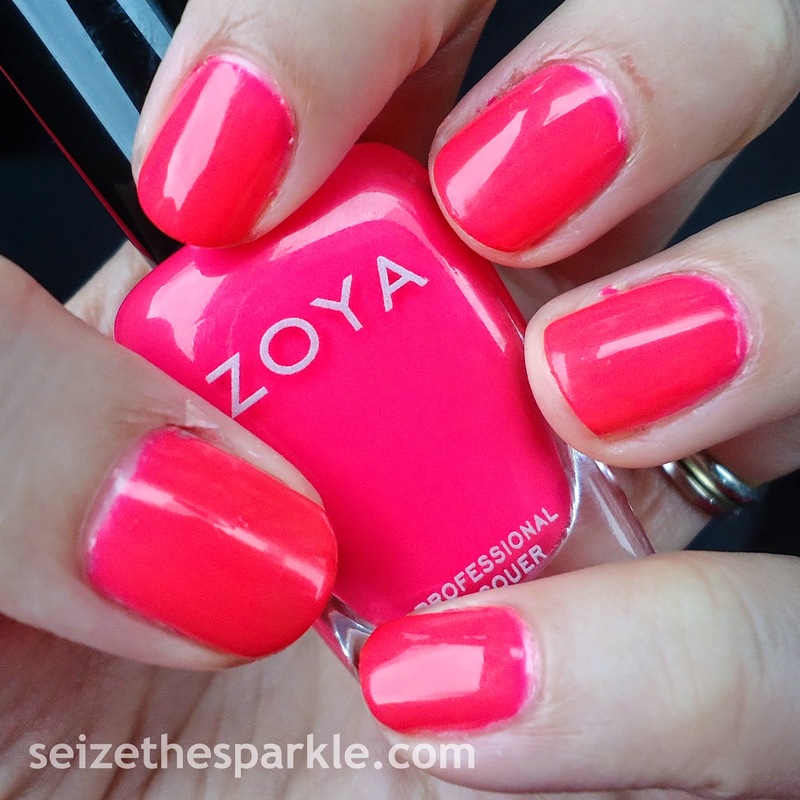 It also introduced me to Zoya polish. 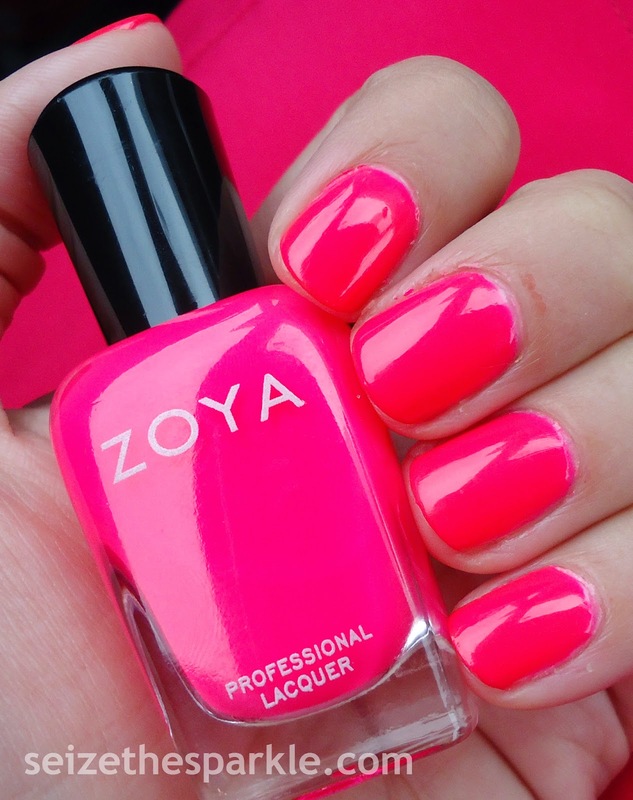 I was researching the pink from the opening credits, and everywhere I looked claimed it was Ali by Zoya. I'm not sure if that's ever been confirmed by a member of the makeup team or not. 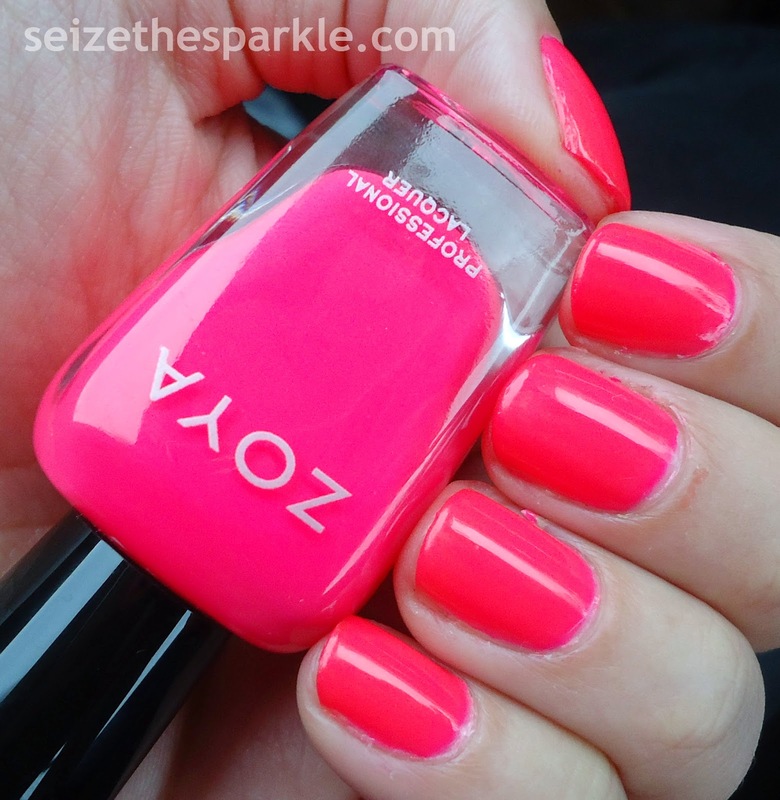 At the time though, I had never heard of Zoya polish. Almost five years later, and I've got a healthy amount of Zoya polishes in my stash, and Ali is finally one of them! We may not have any clue who Charles is, why he's A, or if he's responsible for all the unsolved murders in Rosewood... but it's been a fun, wild, and crAzy ride following the show for the past 5 seasons. Application was great... 3 coats and I had complete coverage on my nails. Neons do tend to dry matte, so I used 2 coats of clear before adding Good To Go by Essie. Gotta stay shiny! I'm seriously loving how bright this shade is. Originally, I had planned to do a dry brush mani over A Latte Love, and it was all going well enough until I decided to add lime green and ruin the entire thing. Zoya Ali was the pink I had out for my nail art, soooooo. Also, I'm on a bit of a kick with not-swatched-but-worn-often shades from my stash. Which is good! But yeah, the brightness on my nails is just awesome right now, considering all the rain that they're forecasting for the next couple of days. Definitely more welcome than snow... I will sooooo take some April showers over snow and ice Any. Day. Of. The. Week.